Dallying with Tom Ford Private Blend Tobacco Oud sent me looking for my sample of Serge Lutens Chergui. It had probably been a couple of years since I’d smelled it. When it took more than a minute to find the tiny vial in a shoebox of samples, I wondered why I was going to all the trouble. Chergui is tobacco and hay. A nice spicy oriental. I know what this one is all about, right? Wrong. As I’ve been discovering lately with other fragrances I’ve haven’t smelled in a while, Chergui is not exactly what I remembered. Maybe it’s because I’ve sampled so many perfumes between now and the last time I sniffed Chergui and so have a larger frame of reference. Or maybe my taste is changing. But today Chergui to me smells much more complete and complex than I’d remembered. Chergui (pronounced “share-ghee” with a hard “g”)1 Eau de Parfum was released in 2005 and was developed by perfumer Christopher Sheldrake. Its notes include honey, musk, incense, tobacco leaf, hay, amber, iris, rose and sandalwood. Its liquid is mink brown. Yes, Chergui smells like hay and dry tobacco, but with a classical structure kicked off by the tart citrus top notes and maybe the whiff of lavender of a gentleman’s cologne. In a flash, they vanish into Chergui’s main story. Unlike Serge Lutens Fumerie Turque, which is all about the humidor, Chergui’s heart is cooled and lightened with flowers — iris stands out the most to me, although it's subtle — and sweetened just a touch. It’s cooler and drier than I remembered. Also, I didn’t remember Chergui’s musk, but it’s definitely present as a clean, refreshing thread woven through the fragrance’s thick, dry body. After fifteen minutes, though, what stands out most is dried, unsmoked tobacco leaf (the plant and not the processed cigarette or pipe tobacco) and sweet hay. As Chergui settles over its six or eight hour quiet life on my skin, the tobacco eventually burns away, and soft sandalwood and spicy amber — the stamp of an oriental fragrance — eases Chergui to its last breath. Lots of perfume writers have pointed to Morocco in their Chergui reviews. To me, Chergui smells dreamy and vaguely Victorian. Smelling Chergui and closing my eyes, I see hand-drawn Rube Goldberg contraptions and smoky gentlemen’s clubs. It hews masculine. I think Fran Lebowitz would adore Chergui, and Oscar Wilde might have sprayed it around his library, although I think he would have chosen something violet-based for personal wear (Etat Libre d’Orange could set him up nicely, I bet). Steampunk fragrance aficionados must have Chergui in their collections. Have you ever been surprised by a fragrance you thought you knew and put away, then smelled months or years later? I’ve been loving getting to know the neglected corners of my perfume cupboard. Serge Lutens Chergui Eau de Parfum is part of the export line and costs $130 for 50 ml. (Or you can drop $290 for the 75 ml bell jar.) For information on where to buy it, see Serge Lutens under Perfume Houses. 1. If you ever find yourself stumped by how to pronounce perfume names, visit the blog Frag Name of the Day. Bela has recorded the pronunciations of more than 1,000 perfume and perfume-related words. My dream is to someday string them all into one giant recording so I can listen to Bela’s charming voice and all those fabulous words as I fall asleep. Oh my gosh! That’s perfect! Yes, it seems to me you really do need to sample this one. Guess I am getting older, I have no idea what the term, ‘Steampunk’ means..I see it everywhere. Check out the wikipedia link. It’s pretty interesting, I think. A whole cultural phenomenon. Do check out the link as it gives a pretty excellent sum up. The best thing about steampunk to my mind is how open it is to embracing whatever ones imagination can come up with. I also do some renaissance reenactment and often creativity ends up squashed in favor of historical accuracy. Steampunk is the exact opposite of that and so is a marvelously diverse and welcoming atmosphere! If you are getting soft sandalwood and spicy amber from Chergui, I need to try it. I always think of this as a tobacco scent and those don’t sit well with me. But the scent of plant tobacco vs. pipe tobacco can be OK at times and could be worth it to get to sandalwood and amber. OK, I’m sold too! There are many scents I’ve re-visited that surprised me. Chanel No 5 was one. Nice, no big deal, put it away. One day I pulled out the decant, sprayed it on and thought, “Gosh, no wonder everyone raves!” However, I’m still in the dark on Shalimar, Mitsouko, and Joy. Love Bela’s site and I’m with you, could listen to her all day! Well, tobacco is still definitely the dominant note well into its wear, so if you don’t love tobacco, you could probably find a good spicy sandalwood scent elsewhere. You know, I could stand to revisit No. 5, too. I wonder what I’d find now? I am right there with you on the Guerlains. I wanted so badly to love shalimar and mitsouko. Complete gaggers on me! Maybe someday my nose will grow up? For me, the door to Mitsouko was smelling some old EdC, but it’s not an easy fragrance for most people to love, I think. Both Mitsouko and Shalimar are so baroque. This has been on my buy list for awhile now, and I FINALLY bought it this holiday for my husband. (I wear his colognes, so he knows I always have an ulterior motive when he gets a new frag). It does smell glorious on us both! Fumerie Turque is on the list, as well as L’artisan havana vanille/whatever they’re calling it all now. My latest re-surprise was CK Obsession. I was killing time in macy’s and the SA istened to what Iiked, then waved a stick at me. My eyes lit up and I OOo’d! When she told me what it was, I was shocked. I swear I had smelled it before and was unimpressed. Good for you on the Obsession! There’s something great about finding a good old standby department store fragrance that you love. Lovely review!! I love Chergui – it’s a wonderfully warm comfort scent that I wear in the winter – ideal in the foul weather we are having right now. I find the tobacco is very mellow and blends beautifully with the amber. The top notes include a slightly menthol air for me that I suppose must come from the lavender it’s quite uplifting but it’s just for a minute or two. The dry down is gorgeous and very long lasting. I just guessed on the lavender–I don’t know if it’s really there or not–but I’m glad to know someone else gets it, too! I wore this the other day after having neglecting it for far too long. What I get is a lot of powder, and I wish that would be toned down a bit. A little lasts all day on me, I love the far dry down. Today I went for Clive Christian C for Men, again after having neglecting my sample for a long time. The temp is hovering around 0, so a loud oud (l’oud) seemed appropo today. Too bad so much powder comes out on you! Angela, I agree with you in that I totally don’t get the desert wind from this perfume. I think I remember reading somewhere that the name actually comes from the word for desert wind in Morocco. I could have that completely scrambled though! I was not in love with Chergui the first few times I tested it. The notes, however, sounded so perfect that I kept trying it and a shop eventually gave me several samples. A couple in and I was totally hooked. There is no other perfume in my collection that is so indispensable. I bought my bottle around Christmas 2012 and though I have bought other perfumes since, none is so dear to me. It’s so nice to have a go-to perfume to reach for, and Chergui is great, especially, for chilly weather. It’s funny, too, how often the fragrances I struggle to “get” end up being the ones I love most in the end. I don’t really use it as a go-to perfume – using any particular fragrance too often makes it annoying to me. Also, it is one of the higher-end perfumes in my collection, so I am a little selective with it. I use it when i have to do something particularly stressful, or when I’m in a really bad space. Often I will just use one spritz on my chest so I have a hint of it throughout the day, and have something totally different on my arms. I guess I treat it as a holy elixir, lol! How do you find Chergui compares to Tauer L’air du Desert Marocain? Oh, to me they’re really different. L’air is really resinous, for one thing, which Chergui is not at all. Chergui is a favorite of mine for fall. I finally bought a bottle with a gift card I got for my birthday back in September. I don’t think of the desert either. There is something in it that makes me think of the texture of a crumbly sugar cube. It’s comforting and warm. I have a sample of Fumerie Turque that I haven’t spent a lot of time with. I need to find it and compare the two. I remember it being more tobacco with milk and honey and less spicy and leathery than Chergui. It would be interesting to compare side-by-side. I love how you use texture–crumbly like a sugar cube–to describe a fragrance! Your comparison of Fumerie Turque and Chergui sounds right on to me. I think I have the opposite impression – that Chergui is much more silky and sweet than Fumerie Turque which is, to my nose a tougher fragrance. Fumerie Turque is pretty danged sweet. You make me want to sample them side by side, though. Chergui smells like the friends’ houses my grandmother used to drag me to when I was a kid – dust, mildew… old people… (I know, I know: I Am Horrible). I just. Can’t. Wear it. I did much better with Fumerie Turque, though that one went fanTAStically filthy on me toward the end. I find that really funny – I mean, I wish aged people smelled like Chergui to me! True confession: I once got to smell some Guerlain parfum…and it smelled like decrepitude to me. Hangs head in shame. I wonder which Guerlain it was? Some of them definitely aren’t in fashion anymore, but they’re wonderful nonetheless (at least to me!). It was the first time I tried Jicky and Vol de Nuit in any format. I also tried L’heure Bleue – and same effect. I have L’heure Bleue in EDT, actually, and I really like it, but the parfum was a no! I’m pretty indifferent to what is in fashion – at least consciously, but I must have had some unpleasant experience associated with that old Guerlain base that triggers the anathema. Because of that, I suppose, I’m not able to enjoy the nuances and quality that everyone else so adores. Not every brand is for everyone–that’s for sure! With the Guerlains, I prefer the EdTs of some of the fragrances, too–especially Jicky and Mitsouko. I’m with you on Guerlain. Objectively I admire the line – so original and complex – but there’s some base formula in them all which alienates me. I just can’t wear the juice. Ironically, because it wasn’t well reviewed here, the L’Heure de Nuit flanker that came out recently really appealed to me, much more than L’Heure Bleue. But otherwise I stick with the Acqua Allegorias. It must be the famous Guerlinade–the base of so many–that turns you off. Lol I’m the opposite… guerlains smell like diaper creme to me! Powdery, maybe? I’m imagining Shalimar on a baby’s hind end. That would be some diaper creme! I just wanted to add that most people I have asked to smell Chergui on me – i.e. ‘smell my wrist’, have wrinkled their noses in disgust! I think I like Fumerie Turque better, but I should retry Chergui. I do often find that perfumes smell different to me over time. May favorite floral tobacco is Ys Uzac Pohadka, which also has mint. I love it in the spring! Just read the description – it sounds lovely! Angela, I was just thinking about Chergui the other day – I must really find my little decant and wear it again soon, it’s been ages. I remember being given a list of notes from an SA when I first tried Chergui, and one of the notes was “hay sugar.” I thought to myself, “what the heck is hay sugar?” but couldn’t imagine being given an intelligible answer, so I never asked. Maybe it was just a typo, but whatever, it makes perfect sense as a descriptor. It’s a scent that was almost always too sweet for me, and I struggled to like it, but then one day the stars aligned, or the weather was just right, and it was perfect. It’s a real changeling on me. I can’t tell you how many times I’ve tried something and just not “got” it, and then all of the sudden–boom!–it comes together for me. I’ve seen “hay sugar” listed, too, but I don’t know what it is, either. So here I am, sitting at my desk… I decide to visit NST before going to bed (it’s really late in Londinium) and what do I read… LOL! Thank you so much for your kind words, Angela. Happy New Year, btw, to you and all NST readers. Happy New Year to you, too, and sweet dreams! Happy 2014, Angela, and thank you for the wonderful review. Now, where is my sample…! I know that question well! And happy 2014 to you, too. I’m afraid I mainly know Chergui through having bought a dupe from an online outfit called Cocoa Pink. I found it very easy to like at first and wore it a lot for a few months in winter. Spritzing a tester of the real stuff in a shop, I could not detect much difference between that and the dupe. In my mind there was no need to plonk down serious money for the Lutens when I could have the dupe for a song. 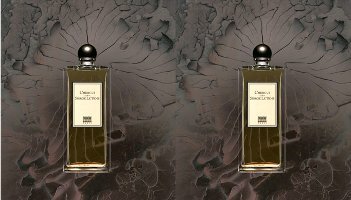 What I should do is compare the Chergui dupe with the original again to see if, after having smelled a lot of other perfume, I can detect the difference. Sniffing experience also educates you not just in a diversity of perfumes, but in complexity and quality of raw materials. Maybe I’ll notice harsh, unfinished bits in the dupe that I did not notice before. Anyway, I do have Cocoa Pink to thank for having saved me quite a lot of $$ on a perfume I would not have worn much. I ADORE your idea of moth balls, toast, and Turkish delight to round out the CS Lewis idea! The only dupes I’ve smelled side by side with the real ones were drugstore dupes, and I only sampled the No. 5 dupe side by side. In that case, at least, I could definitely tell the difference. Oddly, after fifteen minutes Chegui smells exactly like Bulgari Black on me. Bulgari Black gets really musky on me. Ah, the mysteries of skin chemistry! That’s funny you say that! My husband regularly wears Black. Several times since I gave him Chergui, I’ve mistaken it for Black. Just in case anyone is interested in buying a full bottle of Chergui, it is available right now at fragrancenet (and maybe other online discounters as well) for a very good price. Thanks for the tip–I’ve seen it at parfum1, too. I didn’t like Rose Ikebana at all, so the sample just sat there waiting for that perfect someone to give it to. Then a hot summer day came along that demanded a citrus scent and I dabbed some on…Now I have a FB, and when I need a touch more rose in it I just add a feather of Sa Majeste La Rose. Sublime! Very nice! So perfect for summer, too. I loved Chergui at first try. However, I never seemed to be “in the mood” for it. It was always either too soft, too powdery, too feminine, to strong… too something! While it is still not one that I reach for frequently, I do wear it more often. Two that I had to revisit to appreciate are Déclaration (Cartier) and Pour Monsieur (Chanel). Déclaration I bought going through Duty Free at Kennedy Airport. Seemed nice at first but I soon took a dislike to it. I nicknamed it “Dirty Ashtray” for a long time. But after years of just sitting there, I am now happy that I kept it. I wore Pour Monsieur Concentré for years-probably the closest thing to a signature scent. By accident, my parents bought me a bottle of Pour Monsieur (not concentré). That bottle had to wait for almost 20 years before I was ready to fully appreciate its content. You are truly patient to wait 20 years to wear your Pour Monsieur! You get big gold star for your patience and repeated tries. Patient/pack rat…the jury is still out. I just can’t get rid of a full bottle. It just sat there looking pretty. Plus, I know that my bottle dates back to before all the reformulation fiasco.